Biology Professor David Fisher launched the nation’s first four-year BA program in Sustainable Living at MUM in 2003. 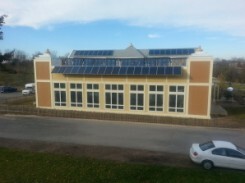 The Sustainable Living Department offers courses in solar, wind and other alternative energy systems, water management, permaculture, alternative building techniques, and performance design for the built environment, and their building serves as a hands-on showcase for the technologies they teach. On an annual basis, the building is not only a “net zero” building, but actually produces as much as 40% more energy than it consumes. The excess energy offsets electricity used elsewhere on campus. A drain-back solar water heating system with 750 square feet of evacuated tube solar thermal collectors capture solar energy that is then stored in a 5,000 gallon tank, where it is then pumped through the in-floor heating system. The collectors provide about 30% of the heating for the building. Additional heat comes from a ground source heat pump, which uses electricity from the solar and wind systems to provide 75,000 BTUs per hour. Article reprinted with permission from the author. Solar Tribune is a solar news, education, and advocacy website. Article is published under: Featured System, Solar Education, Solar Energy News. See more news about MUM’s SLC in this Des Moines Register article: Fairfield defines community action. There was a lot of news coverage on the official opening of MUM’s SLC, April 20, 2012. Here are two TV News reports, with links to other reports: KTVO News: Groundbreaking Sustainable Living Center a source of pride in Fairfield and WHO News: BEYOND GREEN: Building Produces Extra Energy. Also see The Fairfield Ledger: M.U.M.’s newest building sets new green standards. FAIRFIELD – KRUU host Talia Winningham and her Tea Time Camaraderie team grace the cover of this month’s Cityscape, a glossy publication put out by the Iowa League of Cities. 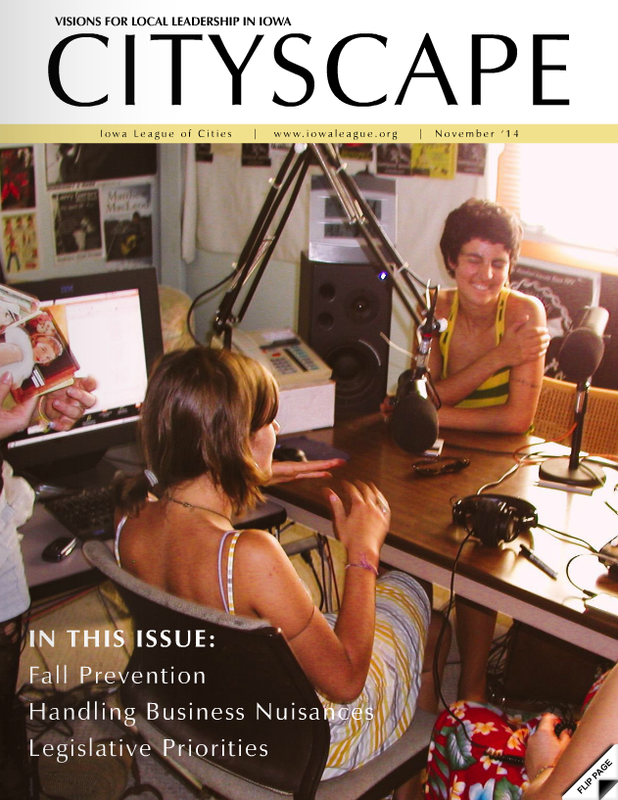 Cityscape is a leading source of information for city officials in Iowa delivered to some 870 member cities. Written by KRUU station manager James Moore on request, “What Local Radio Has Meant to Fairfield” gives a brief history of the station, now in its 8th year of broadcasting. There are pictures of President Barack Obama and former Governor Chet Culver holding up KRUU t-shirts (then governor Tom Vilsack received the first t-shirt but was not photographed). Other shots include Fairfield Mayor Ed Malloy presenting a KRUU Listener Appreciation Mayoral Proclamation and Great Taste host Steve Boss interviewing Eldon Pie Lady Beth Howard. KRUU became the Midwest’s only solar-powered radio station, designed, donated and delivered by the community, on September 9th, 2009 at 9am. The piece also highlights the station’s role in spearheading the successful three-day free annual music and more festival known as FAIRfest, held the third weekend in June; the production of a 20-part radio series in 2011 on statewide sustainability and energy efficiency done in conjunction with the Iowa Power Fund and MUM Media & Communications Department; and some of the scores of programs offered by the 100% locally-produced, nonprofit station who lives up to its mission of giving voice to the community. As a solar station KRUU helps brand the community’s creative, cultural, entrepreneurial and sustainable elements and has inspired tens of thousands of volunteer hours with people from every age group and walk of life, according to Moore. “It’s been more work than any of us imagined and more fun, too,” station co-founder Roland Wells is quoted in the piece. “It’s amazing what people can do, given the chance. Especially in these days of conglomeration, consolidation and syndication. A local radio station is a rare opportunity for a community’s unique flavors to be celebrated and shared. “KRUU also streams online at KRUUfm.com, attracting over 100,000 visitors a month to its website. Just today, Moore said, someone called the station, asking for a cheesecake recipe she heard on the Great Taste program. Where are you calling from, he asked? East LA, she said, and we listen every week. I just wish I was in Fairfield for the show. Did you say East LA? Moore asked. Did you know Los Lobos headlined our summer festival this year? She said, No kidding, I went to school with Conrad (Lozano, the bass player)! We both laughed and said, what a small world. To see Cityscape magazine’s two-page spread on Fairfield with photos, click forward to pages 8-9 in the November 2014 issue: http://www.bluetoad.com/publication/?m=26842&l=1.